Haverhill Town Council celebrated its 25th anniversary with a brief ceremony after the annual town meeting last night. During that time the council has had 20 different mayors and over 100 councillors, and has given over a quarter of a million pounds in grants to local organisations. The town's first mayor, back in 1989 when the town council was formed, was Gerry Kiernan, and he opened a series of speeches which traced the council's development over a quarter of a century. Mr Kiernan, who went on to be leader of St Edmundsbury Borough Council and a portfolio holder at Suffolk County Council during the 1990s, recalled the small beginnings of the town council, with a part-time town clerk working from home. 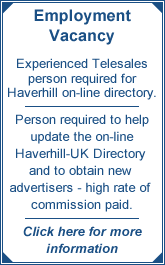 The council was formed, he said, after it was felt Haverhill's voice was not being heard by larger authorities. The headquarters of Suffolk County Council in Ipswich was further away from Haverhill than those of Essex, Cambridgeshire, Bedfordshire and Hertfordshire. St Edmundsbury seemed even further when it was revealed that, out of a large budget spent on leisure and entertainment in the borough, Haverhill had received one Punch And Judy show. The town council began with the aim of providing leisure amenities, entertainment and 'things to do' for Haverhill people, in which it had been very successful with free market square music shows, pensioners' shopping trips, firework shows and many other popular fixtures in the town's calender. Mr Kiernan explained how the badge for the mayoral chain was designed and created, and the logo 'Pro bono publico' - 'for the public good' - was chosen. He then passed over to former town clerk Gordon Mussett, who took up the role in 2000 and was instrumental in the successful initiative to take over running Haverhill Arts Centre after the borough council had proposed cutting much of its output to save money. The Arts Centre, Mr Mussett said, was now a fantastic facility and the envy of every town in the region. When he retired in 2011, Mr Mussett hoped and felt he had left Haverhill a better place for his time here. He then passed over to his successor Will Austin, resplendent in wig and gown, who talked about his time in the role, which he wassad to have had to relinquish earlier this year due to family commitments in Devon, from where he had travelled back for the occasion. He spoke of battles with the borough council over funding, with the health service over the Crown Health Centre closure, and with the county council over youth provision. He said being town clerk was the best job imagineable and he was sure the new town clerk, Colin Poole, who takes over next week, would be a great success. Finally, town mayor Cllr Roger Andre spoke of the town today, a town families were choosing as a comfortable place to live, and all set for growth and prosperity. "Haverhill is open for business," he said. "This is our time, and this is our opportunity." There followed a video show of a year of town events, and then a buffet for invited guests.